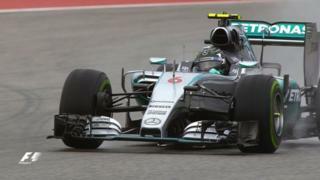 Watch highlights as Nico Rosberg sets the pace in a damp first practice session at the United States Grand Prix before the second is totally washed out by a storm. The German, needing to beat team-mate Lewis Hamilton to retain his slim title hopes, headed the two Red Bulls and Toro Rosso's Carlos Sainz in FP1 before the rains came. Texas is being affected by the periphery of Hurricane Patricia, one of the strongest tropical storms on record, which is on its way to Mexico.